Elephants parade across the plains against the Botswana sunrise. Predators kick up plumes of dust. Birds flock against approaching thunderstorms. The setting sun brings startling pink skies. 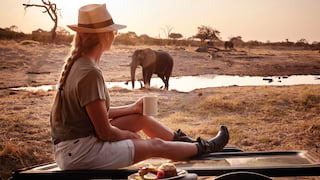 With indulgent and elegant tented rooms, feasts of local delicacies and camps perfectly positioned for game spotting, Belmond safaris sizzle with savannah magic.